Three-year-old Selva Damelio was nonchalant as her pet, Persephone, wrapped itself around her arm like a colorful piece of jewelry. Named for the Greek goddess of vegetation and the underworld, Persephone is a small, harmless corn snake that will eventually grow to four or five feet in length. “She’s smooth,” Selva said. Her brother, Quin, 7, was equally as confident as he held Iris, his Brazilian rainbow boa. “Her forked tongue is really cool,” he said. The Damelios are among the growing number of families raving about reptiles. “The interest in reptiles is incredible,” said Vanessa Lane, who owns geckos and snakes and is an assistant professor of wildlife ecology and management at the Abraham Baldwin Agricultural College in Tifton, Ga.
Snakes, in particular, have many fans. But that wasn’t always the case. The maligned animals have faced an image problem since time immemorial. For starters, there was that sneaky serpent that tempted Eve with an apple in the Garden of Eden. Modern culture hasn’t always been kind, either: How can we forget the horrific basilisk in the second Harry Potter novel or Samuel L. Jackson with all those scary “Snakes on a Plane”? Yet snakes are just one type of cold-blooded creature that is getting a warmer welcome. Tortoises and lizards — particularly bearded dragons and geckos — are also in demand. In 1996, an estimated 2.5 million U.S. households owned one or more reptiles, according to The American Pet Products Association, a not-for-profit trade group for a multibillion-dollar industry. Ten years later, in 2016, the group reported that an estimated 4.7 million households had a reptile in it. Hale owns several reptiles and amphibians, including various snakes, lizards, a blue-tongued skink and an axolotl salamander. He’s also one of more than 800 reptile lovers who have become members of a Facebook group that Damielo started four years ago, called Tallahassee Herps and Exotics. In this group, “You’ll find people who have everything from cute little geckos all the way to cobras and big monitor lizards,” said Damelio. Members also share photos revealing creatures with intricate patterns, vibrant hues and distinctive features. There are chameleons changing color, snakes shedding skin and even a turtle pursuing a bright blue ball. 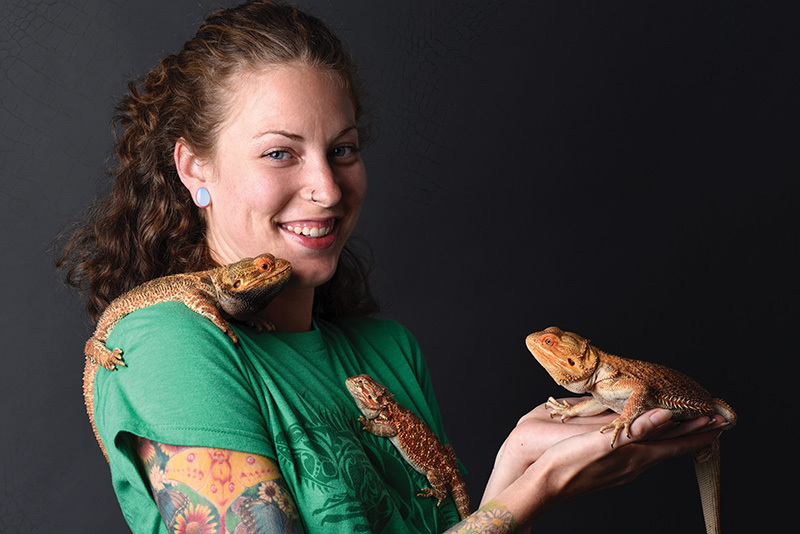 Bearded dragons — especially the babies — also get lots of exposure. In many ways, the reptile world has opened up to novices, thanks to the Internet and everyday reptile enthusiasts who are willing to share their tips. At one meeting at the University of Florida Institute of Food and Agricultural Sciences (UF/IFAS) Leon County Extension Office, Damelio led a discussion on the “Basics of Bio-Active Keeping,” in which he spoke about some techniques for creating “living” enclosures for the animals using isopods (crustaceans), other insects, plants and soils. Damelio keeps dart frogs and geckos in landscaped tanks at his office at Florida State University, where he is a faculty member in visual disabilities in the College of Education. The snakes stay at home. The Damelios also have dogs Irie and Lucy, a kitty named Aslan and an African grey parrot named Condi. Abbee Diaz, a junior studying biology at Valdosta State University who is also a member of the Facebook group, said he learned to like reptiles growing up in the wooded areas of Northeast Tallahassee. “I would see snakes, and the way they moved really fascinated me. I wanted to study more about them,” he said. “When I moved to college, I decided to get my first snake” — a rat snake that he received from a soldier being deployed to Afghanistan. According to Tallahassee author Bruce Means, president of the nonprofit Coastal Plains Institute and Land Conservancy, the Panhandle is a premier biodiversity hotspot, rich in a variety of animals and plants. No area of its size in the United States or Canada has more species of frogs or snakes, and it ranks about third in the world for turtle species. Bruce Means is dedicated to researching reptiles as the president of the nonprofit Coastal Plains Institute and Land Conservancy. Photo courtesy of Lawrence Davidson. He said that antipathy has decreased over the past few decades, as the public has become more educated and knowledgeable — especially with more televised nature shows focusing on reptiles. Still, when a cobra escapes someone’s home or headlines focus on pythons living in the Everglades, fears intensify. In March, a two-foot-long suphan cobra escaped from the home of an Ocala man licensed to handle venomous reptiles. At the time, the snake was under the watch of an apprentice who was not yet licensed to handle them. Florida requires anyone who possesses venomous snakes to be licensed, pay a fee of $100 and meet caging requirements. They must also prove that they’ve received at least 1,000 hours of experience for each type of reptile they own and submit to yearly inspections. Currently, there are about 300 individuals and facilities in Florida licensed by the FWC to own venomous reptiles/conditional species. Forrester Chance Gwaltney, of Wakulla County, is one of them, licensed to keep venomous snakes, including a few rattlesnakes and a four-foot cobra, all bred and raised in captivity. Gwaltney said that most problems involving snakes “are caused by a small number of people who acquire snakes illegally and end up doing something stupid that shines a bad light on everyone else.” A former placekicker and punter for the FSU football team (1998–2003), Gwaltney has been an advocate for reptiles since he was a child, and his dad caught and nearly killed a hognose snake. Gwaltney talked his father into letting him keep it. Its saliva can cause swelling, Gwaltney said, but it’s not toxic for humans. Along the cypress-edged lake at the Tallahassee Museum, visitors can catch a glimpse of green anoles and other colorful lizards, aquatic turtles and the burrows dug by gopher tortoises. The museum also has a reptile section that includes the nonvenomous red rat snake, grey rat snake and pine snakes, plus three venomous snakes: the cottonmouth water moccasin and the EaStern diamondback and dusky pygmy rattlesnakes. For years, an attraction to reptiles was considered a “guy thing”; but that’s not the case anymore: Female visitors to Tallahassee Museum also enjoy seeing the museum’s reptilian residents. In fact, women are some of the most passionate fans of reptiles. “I used to catch snakes in the backyard,” said Lane, who grew up in the Catskill Mountains. Nicole Wiedemann, a Tallahassee entrepreneur and the mother of an eight-year-old boy, has gradually added more reptiles to her family’s collection of pets, including a crested gecko named Ziggy, a bearded dragon named Teal’c, a yellow-bellied slider (turtle) named Morla and, in spite of her dread of feeding them their diet of mice, two corn snakes named Eric and Kilgore. “Reptiles are easy to keep in an apartment, which is why they’re becoming more popular with students,” said Carol Hoover, owner of Carol’s Critters, which stocks rows of tanks filled with reptiles that cost anywhere from $25 to about $400. She personally owns “a bunch of snakes,” three dogs, horses and birds. Hoover noted that landlords generally accept a reptile and won’t charge a pet fee (students should check first), as they might for a dog or cat. While exotic pet ownership has become increasingly popular, the potential germs associated with these pets are not always considered. Germs including bacteria, viruses and parasites that live in and on these animals can pose a health threat when transmitted to people. One of the most common germs carried by amphibians and reptiles is Salmonella. Salmonella can cause illness in people including diarrhea, vomiting and fever. This infection can be life-threatening for young children and people with weakened immune systems. Wash your hands thoroughly with soap and water after touching or feeding reptiles and amphibians, handling the area where reptiles and amphibians live and move, and touching water from the terrarium or aquarium of the reptile or amphibian. Help children wash their hands properly after handling reptiles, amphibians, and their habitats as well. Do not let children younger than 5 years handle or touch reptiles and amphibians or their terraria without supervision. Don’t keep terrariums or aquariums for amphibians and reptiles in a child’s bedroom.